Each item below has a brief description and is accompanied by a button that takes you to the appropriate secure purchase page. The BandCamp embeds are here so you can listen and sample the albums. Please use the buttons for purchase as Gumroad does not take such a large slice as BandCamp. PayPal and credit card options available. Well now. I thought the last album was hard! Hippopotamus Suitcase is likely the final Atomic Shadow album. This is a refinement of previous Musique Concrete experimentation that blends field recordings, modular synthesis, dusty old lab gear and software processing. The album was completed in just a little over two years. When I looked at the size of the folder that had been complied, it came to a little over 12 GB of edit sessions, Cubase projects and bounces. This is the first album that has been compiled, mixed and processed in Cubase. I have to say that I am enjoying it a good deal more than Logic. Kelly Ricks returns to do the cover art, as she has since the 12 Full Moons album. It's my favorite. ​As always, the album eddownload is deliver as full fidelity WAV files, including cover art and a "making of the album" PDF. 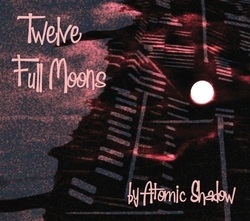 Atomic Shadow returns with a hand crafted album of Classical Electronic soundscapes. Deep, intricate, mysterious and beautifully rich layers of sonic sculpture. This is the "difficult" album - made during a very trying two year period. Getting these sounds out of my head and in to a satisfying arrangement is seldom simple, or straightforward, process. The process on Shortwave Robot Pants took me through several periods of self examination. Why do we make creative effort? What do we achieve as a result? Where does the compulsion to make these sounds come from? In the end, is it worth the effort? I sought, and eventually received, answers to all of these questions. Delivered in full fidelity WAV format. Download includes cover art and a PDF file detailing the making of the album. The City Of Chrome And Glass album was about 18 months in the making. Work began shortly after the release of Twelve Full Moons in April of 2012. I decided to explore some longer compositions for this album and had to edit the tracks down to a shorter length for a proposed vinyl release that did not happen. The album’s theme is the dream of yesterday’s world of tomorrow. During the Atomic Age we believed that by 2014 we would have cities of chrome and glass, free energy and flying cars. There should have been cities on the Moon and colonies on Mars by now. To be honest, I am glad that there are no flying cars. Most people are dangerous enough with regular cars. I released this album during the week of the 50th anniversary of the assassination of President Kennedy. I see November 22, 1963 as the day when the optimistic world of tomorrow ended. My hope is to capture a bit of that mid 20th century spirit and channel it in to building a better world of tomorrow. With the right direction and planning, who knows? One day we may even be evolved enough to safely operate those flying cars. The Twelve Full Moons project began on January of 2011. The idea was to record one track per month at the full of the moon using field recordings and two recently acquired Hewlitt Packard sine wave generators. Over the course of the year the lab took on most of it's present shape as new equipment was added to spice up those sine waves. The year saw the tsunami in Japan and the loss of my best friend to cancer. You can learn a lot by having restrictions on how you go about composing a piece. I learned that the full of the moon is not my most creative time of the lunar cycle. Inevitably I was drawn to the studio during the waxing phase of the moon, a few days past the new moon up to about 3/4s of being full. That was when I made most of the studio recordings. Then I finished editing and mixing and had the track wrapped up by the full moon. Due to the many important things that happened in my life during this year I feel that Twelve Full Moons is a composition of memories and emotions translated as pure sound. Cover art by Kelly Ricks. Released January, 2011. This album focused on a self imposed time limit of 2:30 per piece. It extended the use of processed field recordings in new, and sometimes unintended, directions. This was a quest for finding sounds within sounds. The album now comes with multi-page liner notes in PDF form. I devised a way to amplify very soft sounds and make make them very loud. Many of the basic sounds came from items that are around us everyday. Once these sounds were recorded that was just the beginning. After loading them in the computer they were used (sometimes horribly abused) in layers of sound and effects to arrive at the final result. In some ways this is the most experimental Atomic Shadow album and it can certainly be the most disturbing. While the main inspiration was Science fiction movies of the 1950s, the most frequent comment that I get back on this one is that it sounds like the soundtrack to a horror movie. This is the first Atomic Shadow album, originally released as Project Berna. This special download contains all 12 original tracks in full fidelity WAV form and a new 6 page PDF that explores the origin of Atomic Shadow. There is a description of each track, cover art, and links to interesting articles for those who would like to learn more about the early days of electronic music.